daily commute allows me to get a lot of crocheting done. 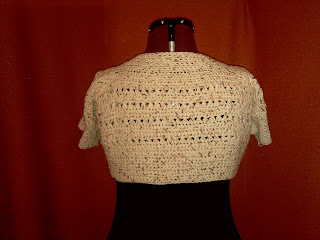 I thought I'd use that as my title... in that I'm often asked how is it that I am able to complete a garment in a short time. With an hour spent in the car headed to work, I crochet endlessly and then continue on my 30 minute train ride yielding several rows and repeating the process on my way home. 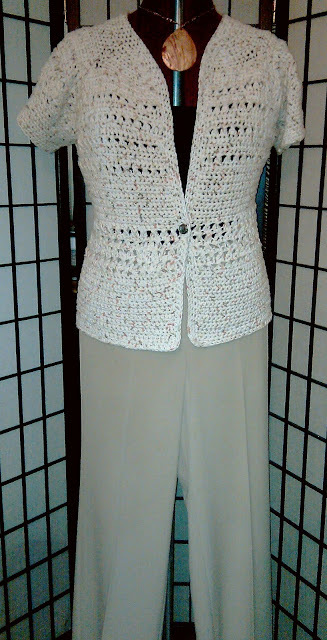 Also, most of my garments are simple, more recently, the top-down technique, single crochet, slip stitches and/or double crochet cross stitches. 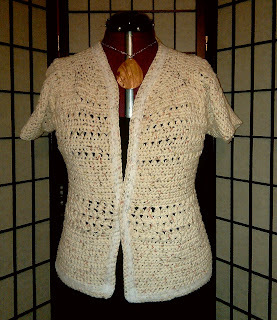 My recent project, named Sonoma was completed in a little over two weeks, and is another modified version of the Ooowee Sweater. 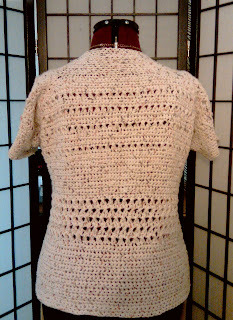 I really enjoy the top-down method eliminating any seaming and the option to try-it on & shape as I progress along. I used Lily Sugar n' Cream Natural Sonoma yarn, 100% cotton. 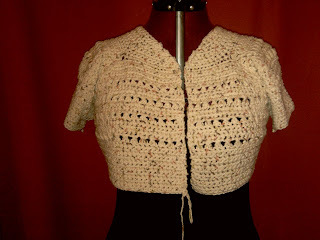 The pic belows shows the sleeves and neckline completed before moving on to the body, again the top-down method offers shaping as I progressed along and decided to get the neckline and sleeves out of the way. As you can see there is really no consistency to my stitch pattern, I started off with slip stitches then progressed on to double crochet cross stitches, I just like the randomness of the 2 stitches. Also, those tall stitches can really speed things along...lol The slip stitch is becoming my all time favorite, it's interesting how the stitches show differently when worked back & forth compared to worked in the round. Once I completed the garment my concerned focused on the hemline and front edges and decided to stablize it with lace hem, which I hand stiched to the inside along the edges. Tomorrow is Friday... Enjoy it! Beautiful sweater and great shoes. Enjoy your day off. 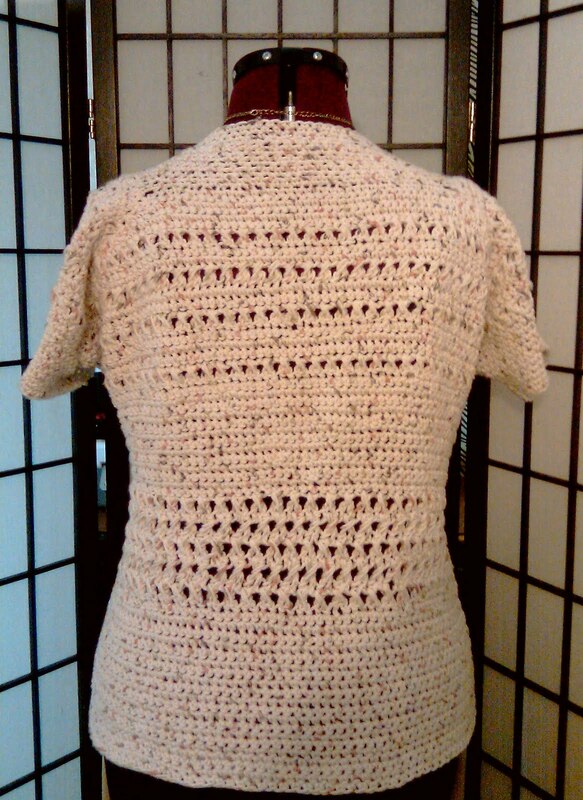 Interesteing to hear how you achieve so much fine crocheting. It is a good thing to do while commuting! the sweater is cute, its great for the summer, those black printed shoes, I absolutely love! How original! That short sleeved sweater came out great. Well I did know that you crocheted to and from work but I'm still envious of the beautiful sweaters you crochet and knit! And seriously those shoes are just TDF!!!! Wow, suddenly I'm feeling like I wish my commute was longer! LOL. Awesome sweaters and I LOVE the shoes - especially the second ones! I have admired your crochet pieces for awhile. They are lovely. I has a Channel feel to it. I like. Your sweater is elegant looking and I love the fact that it is cotton. So much more comfortable than acrylic. You definitely have an inspirational pair of shoes to come up with something fabulous. Aha, I knew you had to have a secret. I am a crochet drop out so am so impressed. And the shoes are terrific. Thanks for the inspiration, you always look so sharp. Wow Sheila, I've been so behind and you've been really busy! I don't know where to start! I love all of your sweaters! The cream colored and the turquoise one are absolutely beautiful! You are so very, very talented in crocheting! Do you make these all without following a pattern? I love your tops you made for the challenge too! That purple one is really nice! You have a "3-hour commute"??!! I will never complain about traffic again! Do you crochet while you're driving??? You are clever! Great cotton top and I could never wear those shoes but I'm glad you can!! Uh-uh, why would you tease me with more fabulous shoes and not tell me what they are? 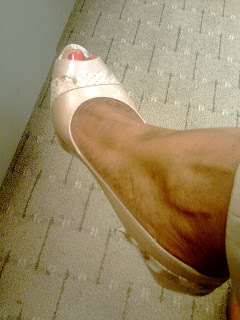 I had to give away my Target peep-toes because they cut into my ankles for some reason, so please give us the brand name of these. Love the sweater too! @ Sister: Sorry dear, the shoes are from Nine West. They have had great sales in the last 3 months and I have managed to catch them each time. Those zebra shoes are the bomb! Shoes that tie or buckle at the ankle are among my favorites. You ar a smart lady to something worthwhile on the train. I'd probably be asleep. Cute cardi and great (I want those) shoes. Wow! Three hour commute! Yes, I would have to get some things done too. LOL! Great sweater Sheila! The shoes are great too. I especially like the second pair with the ankle strap. Thanks for sharing.